600 amps peak current and 89800mAh capacity. It can jump start engines (6.0L gas, 4.0L diesel) up to 30 times in seconds on a single charge! Make sure you and your loved ones never get stranded again. 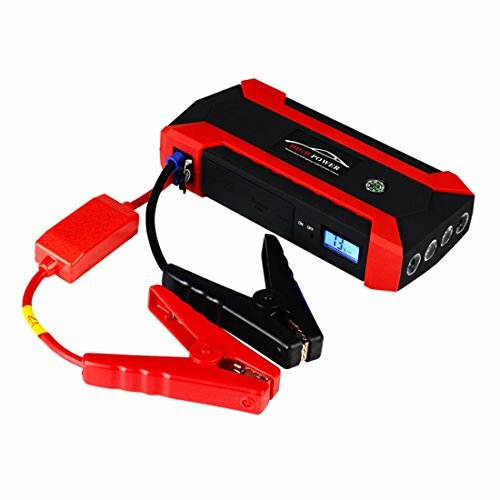 This car jump starter built-in the intelligent jumper clamps, with overcurrent protection, short circuit protection, overload protection, over voltage protection, overcharge protection and other functions. Keep you away from danger. Equipped with four USB port, you can charge your cellphones, tablets and kindles etc. It has a 3-mode LED light (high, strobe and SOS) which is potentially an emergency life saver when you go camping, picnic, outdoor adventure or on investigations. The LCD screen shows you exactly how much power and output voltage is remaining, which helps you make better use of the power and protect your devices. It's small enough to store in your glovebox and light enough to pack in your bag. More Functions: safety hammer, compass, etc. - The non- professional do not dismantle products. - Don't use the product at a high temperature or place it for a long time under a high temperature environment. The Operating temperature : -20℃ ~ 60℃. - Don't jump start any engine that exceed the maximum displacement the unit can bear, or it will cause serous damages to the unit. - Your jump starter will perform best when its battery is fully charged. If less than 25% charged, it may not be able to start your engine. - Don't connect the positive and negative polarity together when it's power on. POWERFUL JUMP STARTER: 600A peak current and 89800mAh capacity ensure to start your vehicle (up to 6.0L gas engine or 4.0L diesel engine) up to 30 times in a single charge. SECURITY ASSURANCE: Built-in the intelligent jumper clamps, with overcurrent protection, short circuit protection, overload protection, over voltage protection, overcharge protection and other functions. Keep you away from danger. SMART CHARGING PORT: With 89800mAh Battery Capacity And Foupr Smart USB Charging Ports. This model can be used to charge smartphones, tablets, laptos kindle and other devices at a high speed. MULTIFUNCTION: LCD screen can exactly show the remaining power. The compass can help you find your way home when get lost in the wild. Built-in 4 LED lights with three modes: flashlight, strobe, SOS. In addition, safety hammers is help when emergency situations. 100% GUARANTEE: You can purchase with confidence, our 100% guarantee provides you with top tech support and friendly customer support to assist you with any problems you may have. If you have any questions about this product by FRIZIONE, contact us by completing and submitting the form below. If you are looking for a specif part number, please include it with your message.